I found Amanda’s blog [Running with Spoons] a few weeks ago, in a typical totally random google-like fashion. And then I obsessively read it. I think it’s pretty awesome because 1 – She’s from Canada. 2 – She’s hilarious. 3 – Canada. One post Amanda does each week is ‘Thinking Out Loud Thursdays’ – which I read last week. And then read the posts of everyone who linked back. And then I decided I totally wanted to participate. The only thing is. It’s Monday. So – I’m starting my Thursday thoughts today. And I’ll finish them before on Thursday. Amanda even made this super cute badge for us to use. See – Canadians are super nice. 1 – On Monday (and Tuesday and Wednesday) this week I wore these earrings. Because, Christmas. Veronica (who is awesome. and also from Canada. 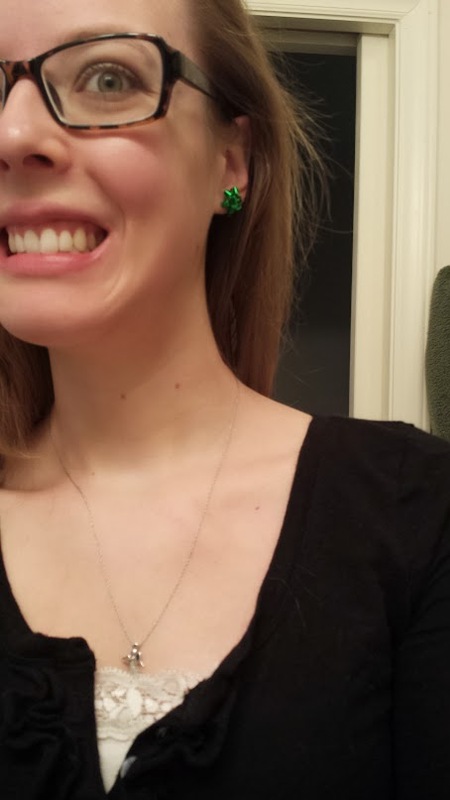 I promise I don’t stalk Canadians) sent me these earrings. 2 – I love winter because I get to wear boots I get to wear really awesome socks that normally wouldn’t be work appropriate but are covered up by my boots. 3 – On Tuesday you got to see our Christmas picture. But what you didn’t see were the (75) outtakes before we got one right. Including this one. Where I tried to convince Indy The Cat. that he wanted to be in the picture too. Spoiler Alert : He didn’t want to be. 4 – Speaking of The Cat. We have finally realized that he does best if he gets his insulin and food at the same time, instead of food, and then insulin an hour later. Which makes the hours of 6am – 7am and 6pm – 7pm a lot easier. And it only took us 12 months to figure that one out. 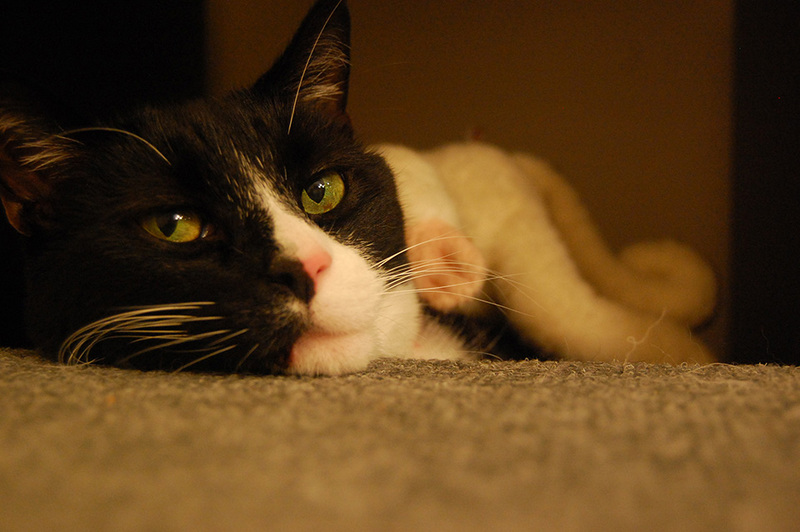 5 – Again, The Cat. (Thinking Out Loud about Cats Thursday). Who typically approaches toys with an attitude of : ‘thank-you-for-the-expensive-toy-that-I-will-now-be-afraid-of-let-me-play-with-this-random-piece-of-plastic-I-dug-out-of-the-trash’, has taken an extreme liking to the cat-nip filled mice that Veronica sent him for Christmas. But only on the stairs. 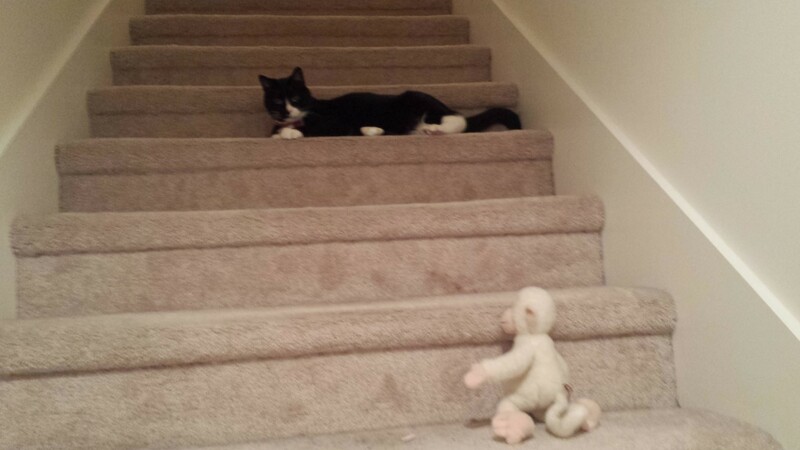 Because the stairs are a perfectly quiet place to play. And only when this Monkey is nearby. 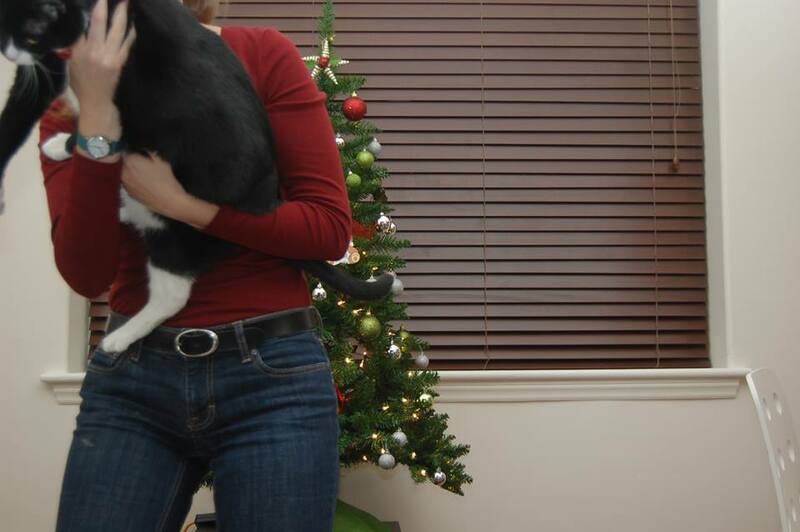 Which is from when he was a wee little kitten. Maybe Canadian cat-nip is of higher quality? Who knows. Speaking of The Monkey, it is going everywhere with him these days. Seriously. 6 – I, apparently, can not read a calendar. I have been on ski patrol for nine ten seasons. Each year in November, we sign up for the weekend days that we will work. I specifically remember signing up for ‘the Friday after Christmas’ and ‘the Saturday after Christmas’ – not considering the fact that those days happen right after each other. When I first started patrol I would often work multiple shifts in a weekend. But that was 10 years ago. And pre job. And pre husband. And pre ‘midnight blast weekends’. And…10 years ago. So, please forgive me as I fall off the internet for the weekend after Friday afternoon. 7 – I just learned (for real) what the word Circa means like 2 weeks ago. And now I want to use it everywhere (reference photo capture number 6). 8 – I really don’t like olives. Do you like olives? 9 – Nathan and his brother each have these plane ornaments. 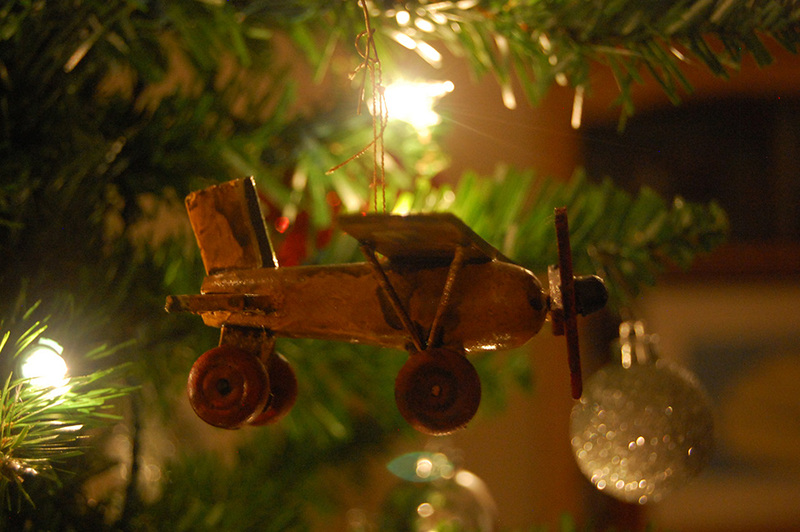 Each Christmas, from the day the tree went up until it came down, they would take turns putting constantly put their plane higher than the other’s plane. Or they would hide the other person’s plane. It got intense sometimes. Last year my sister-in-law and I convinced the boys they should take the planes to their own trees, in their own houses, and all of Christmas has been much, much more civil. Brothers :). Promptly after posting this picture to Instagram, his brother messaged me and told me he’d pay me to move it to a lower branch. 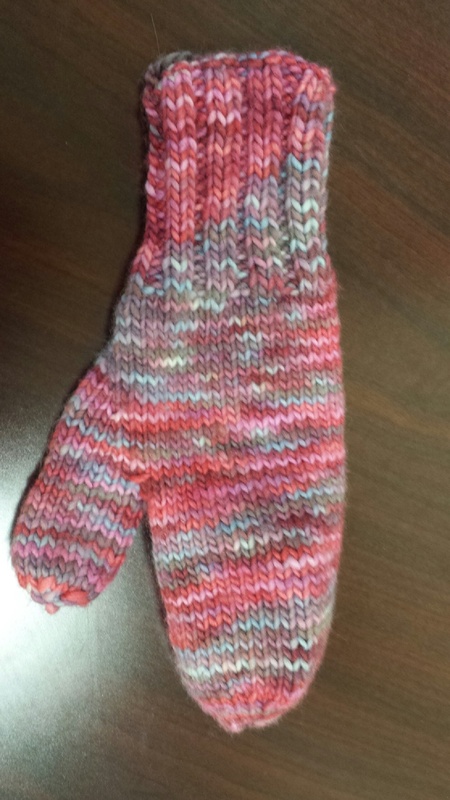 12 – Today was my first day wearing these mittens. (I knitted them in June). I’m pretty in love with the color of this yarn – which is terribly depicted by this phone-picture. They’re so so so warm! 13 – I think those are all of my thoughts from this morning this week. I hope everyone had a fabulously Merry Christmas, and I’ll see you tomorrow for What I Learned Friday! Click Here to check out the linkbacks to other awesome people who are Thinking Out Loud on Thursday! So I just stumbled across your blog, and the fact that you wear Christmas socks covered up by boots in the winter has convinced me we’re soulmates — I do the exact same thing! And the fact that you have moose (meeses?!?) on your socks just makes me love you that much more. Muah! You got yourself a new follower, miss! Also… Canada — which part are you from!? Soulmates!! 🙂 🙂 The mooses/meeeeeses are some of my favorites. We aren’t from Canada [Super Sad Face], but we dream dream dream of living there someday. We honeymooned in Nova Scotia, and recently were in Toronto. We are currently in North Carolina – for a few more months while my husband finishes his masters degree. Love this! 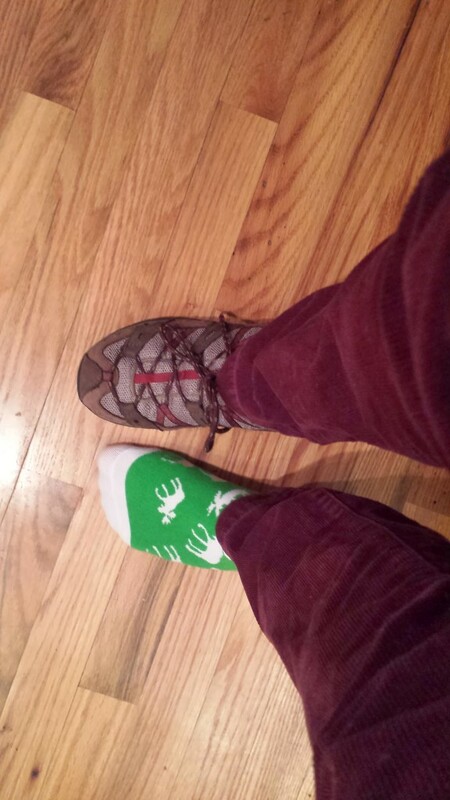 I have to admit that I love olives, but I also love the fun socks …we should have a fun sock day at work! 🙂 Now I know who to give my work-olives too! Yes. Fun socks day is definitely in order. I lOVE the pic of Indy & the monkey – so darn cute! ..Yuck not even black ones for me! But I do love olives ground up in hummus!